Earlier this year I found myself fully entrenched in unfamiliar territory - a deep style rut. I wasn’t feeling particularly jazzed about anything in my closet, although it was bursting (literally) with options, and I found myself recycling the same dull pieces over and over again with very little enthusiasm or variety. As someone who inundates herself with fashion via profession, hobby and extracurricular activities, the thought of exuding less-than-inspirational personal style was both terrifying and foreign to me and yet, here I was, in a giant pile of Nothing To Wear. Walking into any closet filled with clothing you love should bring joy and excitement, because you have carefully curated and feel thrilled about each piece, but I suddenly found myself opening the door with dread and shutting it quickly while running away in a cold sweat. It became clear I needed to adapt some hard and fast rules to overcome this style slump I had fallen into and find my way back to me again. For anyone else with a paddle in this same boat, I hope I can provide some starting tips to help a fellow sister stay afloat - and authentic - in a sea of fast-paced fashion. Whether you go the old-school route of ripping inspirational photos from fashion magazines or fire up a new Pinterest board, start collecting some kind of visual collage and make specific notes detailing why each look is appealing to you. Maybe it’s the way a shirt is tucked into a pair of jeans or how a skirt is styled, or a particular color combination that you find cool. Slowly but surely you’ll see some common themes start to emerge in the images you are drawn to. How often - and easily - do you forget exactly what you have in your fashion arsenal? Do you ever stumble across things with tags still on them, or buy something new only to find 3 similar items already hanging in your closet? This is where taking detailed inventory is going to be your saviour - but first, it’s gonna kill ya. Go through everything, and I mean EVERYTHING, down to the random friendless socks in your laundry room. Make an itemized list - or a spreadsheet if your closet's a real disaster. Toss out anything that looks completely whack or worn-out and then survey what the rest of the swamp looks like. Do you need 12 black tees that are essentially the same? Do you even like the color fuchsia? How many pairs of heels do you own versus how many you actually wear and feel comfortable in? This is when you’re going to employ some ruthlessness and take stock of everything that is no longer serving you, regardless of how on trend it is or how much you purchased it for. If it ain’t you, it ain’t you, babe. The only way to truly find out what you’re gravitating toward, along with the aforementioned Pinterest vision board of your chicest self, is to keep a style tracker. A journal, if you want to be basic. Record everything you wear over a 2 week period. Put a star beside outfits you felt especially sassy in and specific pieces that provoked compliments from others. Put an “X” beside anything you felt less-than-stellar in after you left the house. See what patterns emerge and jive them with your Pinterest themes. Now that you’ve accumulated a large haul from your closet of things that no longer work for you, allow them to find a new life**. Pull out any mint-condition business attire, including shoes and accessories, and box them up for Dress for Success. Host a clothing swap with your girlfriends for your trendy designer pieces that are in excellent condition, or try your hand at selling them on cool platforms like @ourclosetcleanout on Instagram. 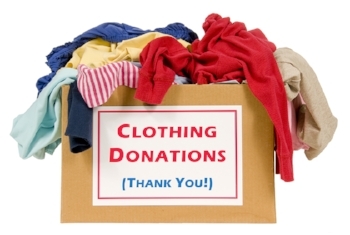 For anything remaining, check with the Salvation Army and local women’s shelters to see what kind of clothing donations they are currently accepting. **Exception: things with sentimental value, things that you truly love and could never part with, limited edition pieces, expensive things that you’re saving because they are dry clean only and that doesn’t work with #momlife -- ARCHIVE. Hang them in black zippered garment bags with a tag on the outside detailing what each item is and store them with love. Don’t be THAT ruthless, girl! Skeptical about this quote's source but the words ring true enough! Now that you’ve cleared out the clutter and know what you want to be rocking every day (for me, it’s high-waisted mom jeans and either a vintage sweatshirt or a cozy cashmere sweater), own that sh*t like Beyoncé. My friend Katie (also a fellow MWS blogger, you’re likely familiar with her hilarity) once dropped some solid advice during one of our many fashion convos: “Make it intentional”. Whatever your style is - and, I’ll admit, I’m saying this especially loud for those who say “But I just wear yoga pants!” - make it intentional!! Sticking with the yoga pants theme, this totally CAN be a style. Hell, get 7 different pairs and make it your weekly rotation! Just take the time when you’re getting dressed to make whatever you’re wearing a cohesive head-to-toe outfit. Lead Pilates, located on Joseph Okemasis Drive, builds their entire merchandising aesthetic on the idea of gym-to-street athletic wear so, if this is your jam, go see the girls there for some style tips and definitely check out their annual fashion show, which is essentially a crash course in gym-to-street styling done incredibly right. Think yoga pants with cool moto stitching paired with a cute knit sweater, a fur vest, ankle booties and a beautiful leather bag, plus a few cool-girl details that are easy to add like a choker and a chunky watch, and suddenly are you *just* wearing yoga pants? I think not, my friend. As for my mom jeans and sweaters, I always do a front-tuck with my shirt and roll or push my sleeves up, plus I add my standard stack of rose gold jewelry (earrings, necklace, rings, watch & a few bracelets), I play with color in the wash of my denim vs. the color of my top, and then I’ll choose things like jacket and shoes depending on the overall look - a bomber and Adidas classics for a sporty look when I’m running around in mom mode, a leather jacket, sparkly socks and heeled booties for when I’m heading out to the meet the girls. The idea is to build a go-to style around things you already know you love to wear and simply add in the details that make it uniquely you to pull it all together. 5 different looks, all featuring leggings, that look fab. You could swap any of the heels for flats or tall boots or sneakers and STILL look fab. When you do find something you like, whether it’s a splurge item or not, use the Rule of Three. My lovely friend and ultra-amazing stylist to many, Kate Matthews, taught me this trick that works every time when deciding “Should I? ?”…can it be styled 3 different ways? If you can think of at least 3 different ways to style something (bonus points for more! ), then by all means, treat yourself!! But if you can only think of one occasion to wear that sparkly sequinned mini dress or cobalt blue faux fur jacket, remind yourself that you can appreciate an aesthetic without adopting it as your own personal style. So, to my fellow ladies who may be feeling the heavy pulls of a style rut, breathe deeply a sigh of relief because the remedy lies within your own closet and it involves feel-good exercises like donating clothing, taking note of what makes YOU feel most beautiful, freeing yourself of any pressure to keep up with the trends, and knowing every day that you’re putting your most authentic self forward, whether you’re off to the grocery store or the Met Gala. And, when the time comes to treat your fabulous self, go to Two Fifty Two Boutique and say that Mandy sent you.